Some of my most vivid childhood memories include “thunderstorm season,” when our southern blue skies turned dark and menacing, the birds disappeared to wherever they go during a thunderstorm, and lightning danced across the sky and rolled off the roof tops in sparks and sizzles. Those were terrifying times . . . and yet I remember them with the warm and fuzzy fondness of yesteryear. 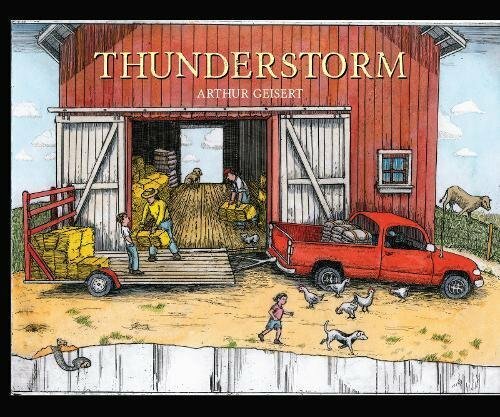 That’s why when I stumbled across a picture book by author/illustrator Arthur Geisert called Thunderstorm, I couldn’t resist it. The title alone conjures memories of fear and high excitement. The bright cover, with its industrious farmers and their unsuspecting children going about their workday without realizing a thunderstorm is brewing, conjures up all my feelings about nature, the elements and days gone by. In this wordless book, readers gets an eye-full of farm life on the open plains; the broad expanse of the farms, the contentment of the farm animals, and even the “unknown” lives of the animals we don’t normally see, like skunks, chipmunks underground, nesting raccoons, and wise old owls in hollowed-out trees. But we see something else, too; a steady progression of gathering clouds that change from grayish-white to angry black as they release sheets of rain that drench everything in sight. We see sparkling-clean clothes on clothing lines flapping in the breeze and families huddled safely in their homes, using buckets to catch the steady drip of rain water coming down from the roof they hadn’t even known was leaking. We see pretty hanging flower baskets swinging wildly in the torrential wind, and even an angry black funnel cloud churning its way to “stir something up” for sure. This sweet book takes an interesting and educational look at a very real part of nature: thunderstorms and high, damaging winds. Its premise may be a bit scary for the very young (I know storms terrified me when I was young! ), but they will surely take comfort from the images they see of both the people and the animals that seek shelter from the storm. They show the comfort, safety and togetherness of being with family and friends in times like these. They also show the strength of the people (and animals) who come out of their hiding places to rebuild their lives. This simple book may be even more important than its author/illustrator knows. The scene that shows the devastation that can occur as the earth gives way to nature soon unfolds to the calmness, serenity and sureness that life goes on after the disaster. This fact itself may teach children much more than any words ever could. This book is a must-have for early elementary classes and a great addition for a “disaster drill” library.